Hi! I'm Zackary! I'm a Stuffed Rabbit. I'm 20 inches (51cm) tall including my ears. I'm an aspiring Stuffed Rabbit Actor with hopes of making movies! I live with a gang of stuffed rabbits and a few teddy bears on my Plushateers' bed. 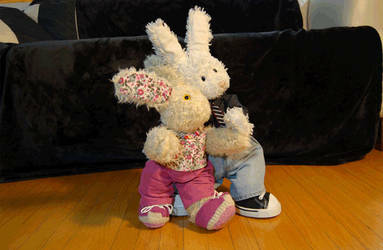 At night, A Little Somebunny's Creation (our Stuffed Rabbit Production Group) make videos while my Plushateer sleeps. I provide free rabbit hugs, and love and support for my Plushateer...and hopefully some entertainment for all the other Stuffed-Rabbit-Lovers out there! ...and I'm batman..but shhh! don't tell anyone! Wow thanks for the faves! YOU'VE BEEN HUGGED!! ! !